(Bloomberg) -- Many financial milestones are dramatic. The recent inclusion of some of China’s onshore bonds in the Bloomberg Barclays Global Aggregate Index may not seem like one of them. But the debut could mark an important stage in the long process of integrating Chinese markets in the global financial system. For international funds that track the gauge, the move further opens the doors to China’s $13 trillion debt market, the world’s third-largest after the U.S. and Japan. It’s a market that offers some of the best returns globally, but struggles to attract foreign investors, who own just 2 percent of onshore bonds. 2. What does it mean for China? It’s a seal of approval for its efforts to modernize its bond market and make it easier for foreign investors to participate. China made a number of enhancements to pave the way, including allowing investors to allocate block trades across portfolios and clarifying some tax collection policies. The move will lead to a sustained increase in purchases from passive funds that replicate the weightings of the index in their portfolios. Citigroup Inc. says foreigners will buy $100 billion to $130 billion of mainland bonds this year, while Standard Chartered Plc forecasts $286 billion by 2021. The extra traffic may jolt discretionary money managers to look beyond the offshore bond market, where many foreign investors focus their activity. 3. Why did China want this? It’s not just the money. While attracting foreign funds will be helpful in offsetting capital outflows, from Beijing’s perspective this is a big step in its push to modernize its financial markets and increase the yuan’s global use. Earlier efforts to open up the debt market included the Bond Connect, a channel for overseas investors via Hong Kong that started in July 2017. There were also changes that made hedging foreign-exchange risks easier. 4. What does it mean for investors? For foreign fund managers, this is a way of diversifying their portfolios and taking advantage of the higher returns. China’s 10-year government bonds yielded 3.06 percent on March 29, compared with 2.41 percent and -0.08 percent on equivalent U.S. and Japanese sovereign notes respectively. State Street Global Advisors and Pictet Asset Management said looser monetary policy by China’s central bank will also support onshore bonds. 5. What’s held overseas investors back in the past? Thin liquidity, for starters. It can be hard to buy some already issued government bonds or corporate notes because the commercial banks that dominate China’s fixed-income market tend to buy and hold. Another drawback is that China lacks the interest-rate derivatives that meet the hedging needs of foreign investors, who are also barred from trading government bond futures. Moreover, there are always concerns about outsized moves in the yuan and unpredictable policy makers. A shock devaluation in August 2015 was followed by draconian policy reactions, such as tighter capital curbs and sudden spikes in the offshore yuan’s borrowing costs. Other challenges include the dubious credit ratings assigned by Chinese graders, which the government is trying to address by bringing in more overseas assessors, and a lack of clarity over how overseas funds are taxed for their investments. 6. How do foreigners access the onshore market? In 2016, the People’s Bank of China allowed most types of overseas financial institutions to invest in the interbank bond market, or CIBM. The downside is that it can take months to complete the registration process and it may require adding mainland staff or local offices. 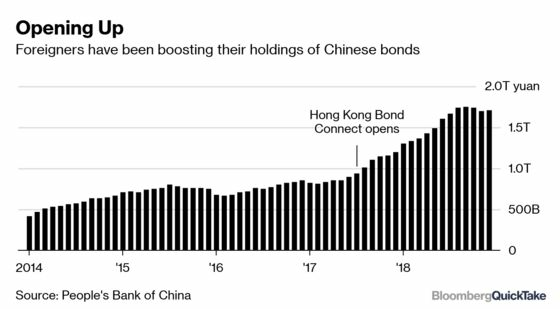 The start of the Hong Kong Bond Connect allowed investors to skip that red tape for their onshore bond purchases. Global funds also can apply to invest via a quota system known as the Qualified Foreign Institutional Investor programs, which requires licenses from securities and foreign-exchange regulators. 7. Are any other indexes looking to add China bonds? FTSE Russell will announce in September whether it will include Chinese government bonds in its flagship gauges of sovereign debt. It may also consider adding corporate notes to another index. JPMorgan Chase & Co. has also placed Chinese debt on watch for inclusion in some of its gauges. If both compilers included debt from China, the country would generate another $140 billion of investment in onshore bonds, according to Morgan Stanley. Bloomberg Markets looks at the changing Chinese attitudes to defaults. Here’s a list of the bonds slated to join the index. A new chapter in China’s bond markets. How China revamped its bond market to lure foreign inflows. 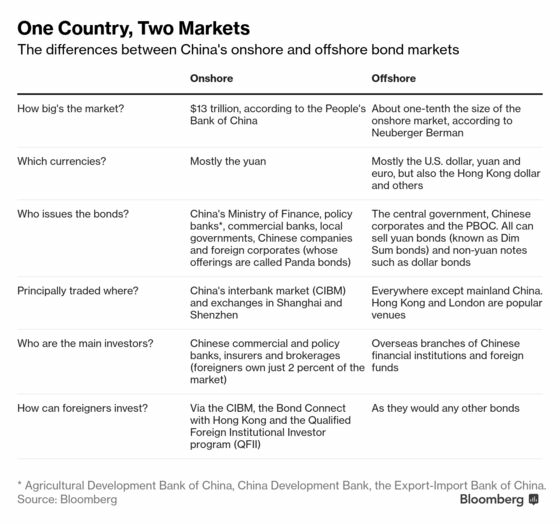 A QuickTake on why China wants those overseas buyers of its debt. Another QuickTake on record Chinese corporate bond defaults.